I have a tendency to get a little, um, obsessed by things and my ‘thing’ of the moment is tidying the house. This, in itself, is pretty magical. Or, if you prefer, crazy-unusual. I love my home and my ‘stuff’ and like to keep a basically sanitary environment (clean kitchen and bathroom, hoover-up the hair balls once a week) but I’m not a great housekeeper or what you’d call anywhere near house proud. However, over the last couple of years I’ve been feeling less comfortable and happy in my home and more ‘argh, I’m going to get buried under all this STUFF’. You know when you go to sort out a tower of clutter and just end up wandering from room to room, searching for places to put things, and then, defeated, you put the pile back down again? That. I like to think of myself as a reasonably non-materialistic person. I don’t often shop as a recreational activity and hardly ever buy clothes for myself. However, there are four of us in a modestly-sized bungalow and I do have tiny book-buying addiction (although that counts as business-related, right?). Add in my thrifty mindset, which has always been of the ‘make do and mend’ and ‘keep hold of it in case I need it/can upcycle it’ bent, then it’s not surprising that we ran out of places to store the clutter quite some time ago. Even knowing all of this, I thought I was keeping on top of things fairly well. I have regular decluttering sessions and am good at passing on outgrown clothes. 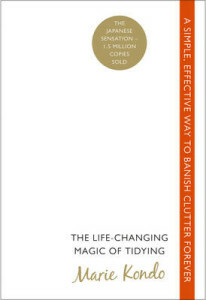 I had just started one of my periodic half-hearted tidying sessions, when I heard about Marie Kondo’s The Life-changing Magic of Tidying: A Simple, Effective Way to Banish Clutter Forever via this blog. It cropped up on another of my regular reads and I took the hint from the universe and bought it. Well. This is a short book, but it’s certainly changed my thoughts on how to tidy. The author is sweetly bonkers but I love her positive approach. She advocates showing gratitude to your home and your possessions and letting go of those which no longer bring you joy. She recommends that you focus on the things you actively want to keep, which makes the whole exercise more enjoyable. She also recommends that you tidy by category, rather than area of the home. You gather every single item that belongs in that category and lay it out on your bed or the floor. Kondo says that this approach will really help you to see your things afresh and help you to make decisions about them and, I have to admit, she’s right. Plus, you only have to make decisions about that category once, rather than several times as you encounter items around the house. So, although it is early days, I’d definitely recommend this book/her approach. For starters, I wouldn’t have started decluttering in the ‘hidden’ spaces of my drawers/wardrobe (I would have begun with visible surfaces) but I swear the room actually feels lighter, which makes me feel motivated about tackling the rest. How about you? Got any tidying tips? Advice for tackling my book collection?